Get ready to flex your creative muscle. 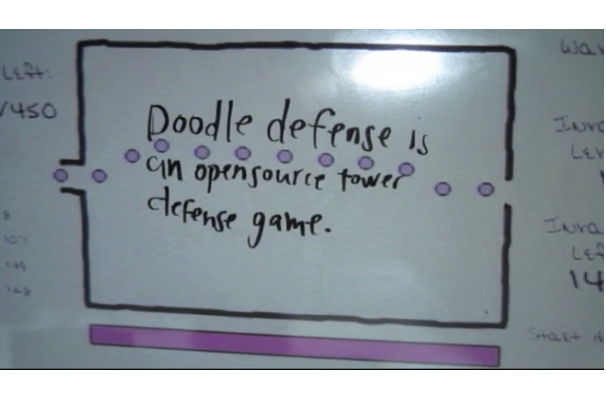 In Andy Wallace's new tower defense game, Doodle Defense, creativity is just as important as strategy as you use your drawings to fend off an oncoming army.. Doodle Defense uses Xbox Kinect and a projector to turn a whiteboard into a game board. As the enemies begin marching across the board, you must draw barriers to divert them and towers to kill them in order to prevent enemies from exiting the play area. By using markers with different colors, you can create towers with different attack modes. The Xbox Kinect monitors the whiteboard, updating the game based on what you've drawn. The projected enemies will respond in real time to your drawings; moving around barriers and falling down dead when the towers shoot them. Wallace originally created Doodle Defense as a class project at Parsons The New School for Design, where he is working on a degree in Design & Technology. He is now looking to develop the game further: First by turning it into an installation piece that can be shown off at gaming conferences, and then bringing Doodle Defense to the general public as an iPad game. In order to accomplish his goals, Wallace is seeking $1500 in funding on Kickstarter. The money will go towards enhancing the mechanics of the game, as well as improving the graphics and sound. Doodle Defense from Andy Wallace on Vimeo.